Well, like I mentioned before, I have not been spending too much time in the kitchen. 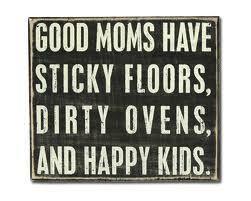 I have been abiding by the sign above and watching my happy children make my floor stickier by each passing summer day. I read this somewhere and know it too well to be true: “Cleaning your house while your children are home is like brushing your teeth while eating oreos.” Amen to that. But, just recently I went on this crazy purging and cleaning spree. A house full of boys and their friends in the summertime, romping carefree through the house, leaving trails of crumbs and puddles from wet swimsuits behind them, just may have been what set me off. And I clearly need more excitement in my life because this following discovery has thrilled me to no end. 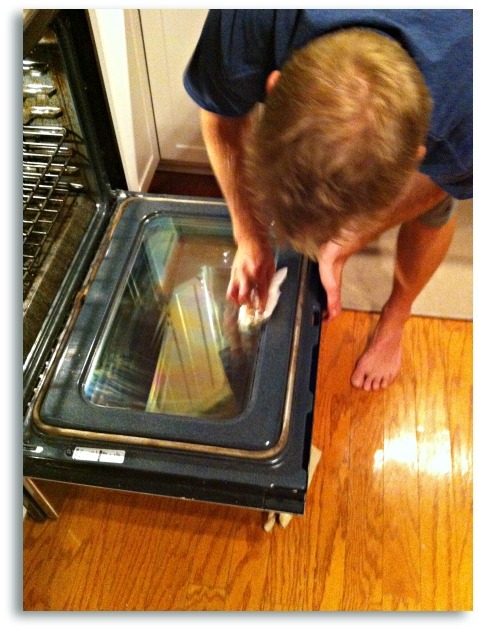 I figured out a magic concoction to clean the disgusting, baked-on crud off of my oven door….without chemicals! And it is a completely quick and easy way to make it sparkly clean. My oven gets a lot of use and I never thought I could get it this see-through again. I do get that my oven has a self-cleaning feature. I just refuse to use it because I hate that smell more than I hate looking at my gross mess in there. So I usually just scrub any immediate messes the best I can and then go about my day. So…after reading about a number of different non-toxic, natural, chemical-free oven cleaning remedies, I finally decided to combine a bunch of ideas and create my own. It was so simple and only involved exactly what I had on hand. First I opened the oven door. Then I sprayed it with a mixture of white Vinegar and Water. Then I covered this mixture with Baking Soda. Then I covered that with Kosher Salt. Then I sprayed a little more of that lovely Vinegar and Water. You could actually hear the Vinegar and Baking Soda working their magic together and sizzling away. Then I waited. I am not good at waiting patiently. I could have let it sit overnight. I figured ten minutes would have to do just fine though. Then I scrubbed. Then my husband started laughing at me. Then he scrubbed. Then I started laughing at him. Note the blurry picture. It is because I was, indeed, laughing at him while capturing this moment on film. Then he got out this AMAZING RETRACTABLE RAZOR (and trust me when I say you want one of these…they are only like $5 or $6 and have hundreds of uses)…. Then he made a few swipes across the entire face of the oven glass. And all of a sudden? THIS HAPPENED!! Every ounce of crud was gone. gone. gone. Note: if you do the above steps, always keep the glass very very wet if you are scraping with a razor so that you do not scratch the glass. 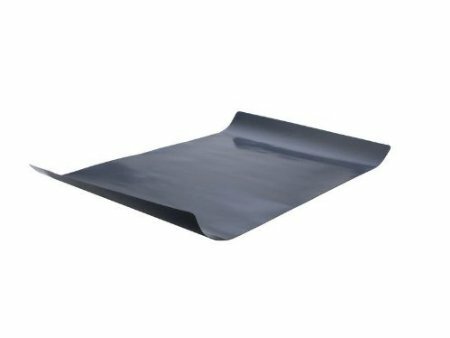 These mats simply wipe clean with a damp cloth. No more messes! Brilliant, I tell you. Brilliant. 1. Mix water and vinegar together in the spray bottle. Spray this mixture all over your oven door and/or the inside of your oven. 2. Sprinkle a thick layer of the Kosher Salt evenly over this mixture. 3. Sprinkle a thick layer of the Baking Soda over the salt. 4. Spray the vinegar/water mixture over the salt and baking soda until it forms a paste. Note: you should begin to hear the vinegar and baking soda working together at this point. Now. Let it sit. 5. Then, using a scouring pad, scrub with a little man power until you start to see the crud coming off. Once you have scrubbed all that you want, get out your razor and, making sure that the mixture stays very wet, gently scrape off any remaining crud. Now go buy your oven liner pronto so you don’t have to ever do this again!! So tell me…how do you clean your oven? Um, yeah, I haven’t cleaned my oven…I guess I need to get on that. Tony and I just mixed up our first homemade cleaner last weekend with vinegar, water and lemon juice. We were shocked at how it cut grease (not that we cook with a lot of oil, but for some reason it seems like it sticks to everything when you do use it). I will never buy cleaners from the store again. Your oven door looks beautiful! I hardly ever use my oven. It sat broken for about 6 years; when I finally got to calling the repairman….he recommends you NEVER, EVER use the self cleaning feature. Often the sensor is placed so close to the oven….IT MELTS! and you havea broken oven for 6 years. Great tip, when I actually use the oven I’ll have to try it. This is a fantastic tip. I clean apartments as a job. I work for the apartment building manager and when people move out,I clean the apartments to ready them for new tenants. I pride myself on doing a thorough job. Not having to use toxic chemical solutions/sprays to do any of my work is ultimately the best thing. Thank you for letting us know your perfect little secret. I will definitely be using this recipe to clean more than just the ovens. My hands,nails,skin,lungs,eyes,…thank you too!! is this mixture of lemon juice, vinegar, and water good at cleaning through grease that dripped onto the bottom of the oven as well? what was the mixture of the concoction?? And I PROMISE you I will make you a frou frou drink that is not coffee-ish at all the next time you are sitting at my counter…which better be sooner than later, of course! 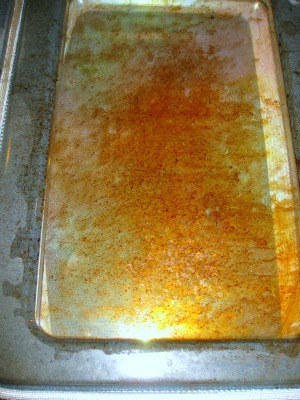 I use same recipe but add a little Arm & Hammer’s washing soda to cut any grease in oven. Leave over night and just wipe clean. No toxic foods to get in food. But, did you have to remind me I need to clean my oven? J/king. Your door looks AMAZING and I LOVE that this is non-toxic!!! I’d like to pin this but can’t find it. 🙁 Is there a way to pin things when there is no “pin it” button? Just copy the website URL and add a pin it will have a place to paste it. So to copy click on the http://cookitallergyfree.com/blog/2012/07/quickest-way-to-clean-your-oven-the-non-toxic-way/#.UUYSvhdnqDl at the top of your browser, right click for the copy menu. Go to pinterest.com add pin, and right click for the paste menu, save to the board. It’s pintastic!! >Heather: Ovens need to be cleaned?< …LOL I love it! Another good chem-free, natural cleaner is tomato juice. Not for oven cleaning–it'd probably be messier than the original grime–but for burned-on, charred gunk in the bottom of cookware (metal or glass) that must be hand-washed, it sure beats soaking, scraping & scouring. Just pour the juice straight from the jar or bottle into your pan, let it sit for a bit (no cooling or heating required), then rinse away all residue. Follow-up with a quick wash & rinse, and your KP duties are over—simple as that! Also this impportant tool is key to cleaning glass stovetops! Ricki! My Mom used vinegar and newspapers on all of our windows too! And then when my sister and I were old enough to help with those kinds of chores, that was the only thing she would ever let us use! I used to hate it because it made my hands look all dirty from the newspaper print, but she insisted it was the only thing that would not leave streaks! 🙂 Cannot wait to see your kitchen, by the way! What a great combination of cleaning ingredients! Can’t wait to try it! Thank you for sharing! Wouldnt a razor scrape stuff off without anything having to be sprayed on it anyway? k, this is how you clean the door/glass. what about the rest of the oven? Same here. I’m also one of you guys. I hate to clean my oven for I find hard time to clean it. Good news for this information. Thank you for I can use this. Thanks so much for the great ideas! I really didn’t realize ovens could be cleaned without chemicals so effectively. I tried it and it worked REALLY WELL! My oven door is now actually… see through! Thanks again. Hey guys, that works for the door but what about the bottom of the oven? I made a peach cobbler a few weeks ago and it bubbled over onto my oven. Does this work for that part as well? Hi Nora, this totally works for the bottom of the oven as well. I just do the same process. It even works for the sides but you have to put a bit more elbow grease into those since you cannot really let it sit on there without it sliding off. Good luck cleaning your cobbler mess! This should work well for it! Someone suggested using ammonia to clean my oven but I’m afraid of the having some kind of chemical reaction. Thoughts? I don’t have any sea salt but have regular salt. Can I use this instead? One last question- How much washing soda would you add to the mix. I use this to make my laundry soap and have plenty of it. Thanks, and I look forward to checking out your blog. can i clean the rest of my oven with it? Please help. I love your recipe for cleaning oven doors, and am going to try it tonight…but my problem is that stuff has dripped down IN BETWEEN the glass in the front and the glass in the back. When I’m looking through my oven door, I can see it in there. I guess removing the inside of my oven door is the only way? Ay ay ay. This was an amazing tip!! Much appreciated! I would like to say the mess was all mine but my husband is the cook and I’m the clean up crew!! please note you can actually buy a glass scraper. it is a razor blade that is made so that it doesn’t scratch glass! They are just as cheap as regular razor blades and you should be able to find them at most hardware stores! Do I cover the water/vinegar mixture with salt/baking soda first…your picture directions and the written directions vary on this point. Not sure if it makes a difference. I’ve pinned your oven cleaning pic to Pinterest. For those of you that don’t know it you put the “pin it” in your browser you will have it handy at all times. Thanks for sharing you oven cleaner. I use Easy off, then once I’ve rinsed the cleaner off, then I use windex and wipe it down, no after fumes or smells when you go to heat it up again. Will this work as well for the built up gunk on the bottom of an oven? Is this recipe ok to use in a gas oven as well?? I invested in a silicone drip catcher that fits in the bottom of the oven. What a great invention…any drips practicality fall off it when you take it out for cleaning. Thanks for the great cleaning tips…natural is the way to go! I am moving out of a rental and I cook 99% of our meals, so the oven’s a mess and it’s a basic model w/o self cleaning feature (which I am repulsed by the odors, anyways). I”ve got to get it clean to pass inspection for security deposit refund and not hire a pro!! Thanks for the oven door and wall tips! Okay, so I read this and HAD to RUN and clean my oven ASAP! My oldest son has severe allergies and my youngest has respiratory problems. Thus, I have had a nasty oven for quite some time due to not using harsh chemical filled cleaners with them in the house. My children never go to a sitter, so they are always here. I love that this “recipe” is safe and doesn’t smell horrible! And my kids didn’t even know I was cleaning the oven until they walked in! <3 this, thanks!!! Yay!! So glad that you tried this out, Nicole! 😉 I am the same as you as I would never used the self-cleaner with any of my children or pets home. I hope your oven got a lot cleaner! At least you know that you did not make anyone sick in the process! LOL Thanks for coming back and letting me know you tried out the “recipe”! I use this same mixture, but use aluminum foil to scrub the crud and it works wonders. Hi I have some coffee marks on the inside of the glass door ( between the double glass) of my oven. Any idea how I can clean that? Can you tell me what Kosha salt is in England ? Kosher salt is available in the UK in some large supermarkets. It’s good for us humans too because it’s lower in sodium although nice and ‘tangy’ – and comes in large crystals. I would bet that if you used cheap sea salt this would work on your oven just as well ! I sell a non toxic, enzyme based oven cleaner, but this is a great recipe! Most self cleaning ovens are lined with Teflon, which releases harmful toxins when heated at the high temp needed to clean the oven and over the counter oven cleaners are even more toxic. It’s great that we have safer alternatives! I use my self cleaning cycle during the winter only. But after reading your blog I’m not using it again. The smell is awful! 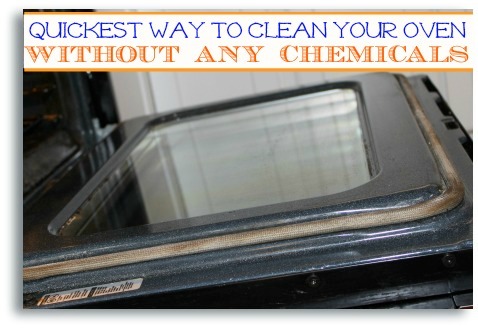 I use vinegar water, baking soda, & my trusty razor all the time, but never have cleaned my oven with it. I just wish I could figure out how to clean those nasty streaks that got in-between the glass of my oven door. I’ve seen the tip on how to take it apart but my oven door doesn’t have screws where it tells you to take it apart. Anyone with ideas? This is how I learned to clean ovens without chemicals when I worked for a commercial cleaning company, and we had to do multiple ovens in apartment buildings every month. Fantastic tips !! Where can I get the silicone drip mats for my oven please? I could not get the glass to clean, but yeah the rest of the oven almost looks like new. Maybe I could let it sit overnight as well. Thanks! Now I don’t have to use the easy off stuff anymore, it kills me every time. Hi! I have a gas oven in which I can’t get to turn the pilot off.There’s also open slots at the bottom. I tried making the paste for the sides and wiping it down with a wet sponge and a lot of the baking soda flakes and some of the rinsing dripped into it. Then I got so frustrated because there was still some baked on stuff that wouldn’t scrub off so I sprayed some 409. Do you have any suggestions? I’m scared to use the oven now 🙁 it worked so well in some places. Love it, Trina!! So glad to hear someone else thinks the same way… 😀 Happy to hear your oven is looking cleaner again too! THanks for sharing! 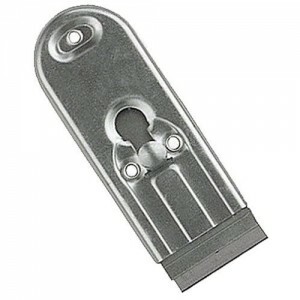 OK…so I went online this morning and looked for something to clean my oven door with. I found a recipe for 1/4 c baking soda and water. Put this on my door window and the porcelain part as well. This did absolutely nothing for the glass, however, it did, with the help of a scrubber pad, take the residue off of the porcelain. When I realized it didn’t come off the window, I cleaned up most of the baking soda mix and sprayed it with vinegar and dawn dishwashing soap. It started bubbling nicely and then I too took my razor knife for the kitchen and started scrubbing the window. With a little more help from scrubber pad and razor knife, it all came out sparkling clean! Yay! So glad that it worked in the end and you can now once again see what is cooking away in your oven! 😀 Crazy what a razor and some chemical reactions can do. LOL Thanks for sharing your results! Just a quick question— in the recipe for cleaning the oven door, it says to use Kosher Salt,but in the directions it says sea salt..Would it make a difference? Is there a difference between Kosher Salt and Sea Salt? I’ve never heard of Kosher Salt. I’ve used this same mixture for my tub grime. I can’t tell you the number of hours and amount of money I’ve wasted trying to get that thing clean. It worked so well that I went out and bought a big supply of baking soda and white vinegar! One suggestion I would add is running the razor blade across after soaking – before all the elbow grease effort, then there is less scrubbing in the end! Anyone know where to buy large gallon jugs of peroxide? Totally unrelated to this cleaning problem. Looking forward to trying this tomorrow. How do you get all of the mixture out of the oven after cleaning it? Can you use it on a gas oven? I’ve always had an electric stove but I’ve had a gas one for almost a year now, which I love but I’m kind of leery about what I can clean it with. Also, would you mind if I put this on my blog with a link to your site? Thanks! Hi there. I noticed how beautiful your floors look in the pictures. How do you keep them shiny. It drives me mad with the three kids and the dogs… Every time it rains… Ugh.. I just wanted to add that I seldom use razor blades for cleaning. I keep old credit cards and those are my go to’s for tubs, shower door, tracks, pots and pans, etc. You’d be surprised how great those little suckers are and they don’t ruin anything. And they’re FREE since you’re re-purposing!! That is an awesome idea, Emmie!! I am so going to do that!! Thanks for sharing! That “razor blade” idea is one I’ve used for years. I even used it on the cast iron frying pans and my casserole dishes. It’s called a Widjet (spelling may not be accurate). Enjoyed your post. Thanx! I use that tool for cleaning my glasstop stove…works like a dream! What about cleaning the bottom of the oven? under the burner part….I tried baking soda and vinegar but no magic for me…maybe I didn’t wait long enough? What do I do? I take it apart! Or, actually get my husband to do it – his hands are stronger. Taking the removable parts of the oven is the best way to reach the spilled liquids between the oven insulation glasses. To be picky, they are chemicals, of course, and you’re working with carbonic acid and sodium acetate. But it’s good stuff–I use it to clear my drains. Just use gloves and don’t inhale the off-gases directly. One question, if I clean my oven/stove top with baking soda, should I wet the surface first or just sprinkle it on dry? Thanks for the oven cleaning recipe. – How do get the oven racks clean?